This article is about the top 10 biggest dams in the world. This Dam was the largest dam in the World by Structure, was built in 1976 to 1978 and alteration in 1995. It also called as Mildred Lake Settling Basin (MLSB), its volume about 540 to 720 million cubic meters Cubic Meters according to the report and the Height of the Dams structure 88 meters. Tarbela Dam, construction begun in 1968 and completed on 1976.The Dam volume is about 106 to 152 million Cubic meters with the structure height of 143 meters, The Dam created Tarbela Reservoir with the surface area of 250 square kilometres. This is one of the Old Dam and constructed in 1933 to 1940, the Structure volume of the dam is around 96 million cubic meters and its Height of the dam structure is 76.4 meters. Fort Peck Dam creates Fort Peck Lake with the Surface of 245,000 acres. The original name of the Ataturk dam was Karababa, constructed in 1983 to 1992. The Structure volume of the dam is around 84 million Cubic meters, height of the dam structure 166 meters and length is about 1819 meters. Guri Dam is constructed in 1963 to 1978, the Dam Can Store Structure Volume around 70 million cubic meters its height from the construction surface is 162 meters. The Dam created by Caroni River and Creates Guri Reservoir that has Surface area about 4,250 square kilometres. Gardniner Dam is built on South Saskatchewan River. The dam constructed on 1959 to 1967. The dam has a width of 1.5 km with height of 64 meters at its base, the Volume of the Structure is about 65.4 million cubic meters. The Mangla Dam which is constructed in 1961 to 1967, the dam built on the Jhelum River. The Dam rises 138 meter in height and 3.14 km in length, the structure volume is 65 million cubic meters. Oroville is in the east of Oroville, the Embankment Dam built on the Feather River. The Dam has Height 230 meter, Length 2,110 meters and the Structure Volume 59.6 million cubic meters. Located: South Dakota, United States. 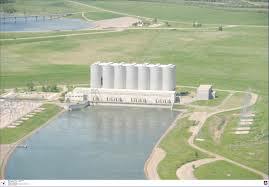 The Oahe Dam is a largest dam and creates four artificial reservoirs. The dam’s construction begun in 1948.its height is about 75000 cubic meters, length 372 kilometres and the structured volume 1,122,000 cubic yards. The power plant provides electricity for much of the north-central United States.